THE LITTER PAN FOR “STAND-UP” CATS! Do you have a cat who uses the litter pan faithfully but STANDS UP to urinate? The result is that the urine winds up on the wall and under the pan. But from the cat’s standpoint, he was in the litter pan! You wind up putting plastic on the wall and under the pan and laying down paper towels to sop up the urine, but none of this is very satisfactory. Covered litter pans are not that satisfactory either because they have that ledge running around them where the two halves fit together. But this ledge just serves as a place for urine to gather, stagnate, and result in an offensive odor. A friend of ours, Dean, had this problem with his cats years ago and used the top of an old-model covered pan to form a “shower stall” model. We searched in vain for a covered pan without the vent but could not find one. What could we use as a substitute? At our local discount store, we found the solution -- an 18-gallon Rubbermaid Roughneck Storage Tote. We cut a hole in the side, discarded the lid, added litter and we were in business. This works very well because it has high sides and is fairly roomy. Keep in mind that in any area where your stand-up cat goes, all of the litter pans need to be the shower stall type. The only drawback we can see is that it is more difficult to wash out each week in our laundry tub. In fact, our former pet-sitter dubbed it the “Titanic” because it wouldn’t sink under the water to wash it. Since we have started making and using these cat pans, Rubbermaid has introduced a high-sided litter pan which is almost exactly the same width and length but is only 11 inches high compared to the 16.5 inches for the storage tote. It also features the opening in the short end as opposed to the long side. We stopped putting the opening in the short end because the cat would enter and urinate out the door! 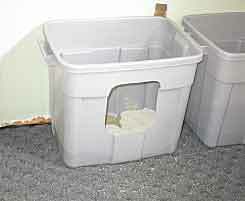 The Rubbermaid Pets Extra Large Litter Box also is pricier than the tote – about $17 versus about $4 for the tote. Why not use the lid? Cat behaviorists long have advised owners of cats who house soil to avoid covered litter pans. Covered pans have a limited point of access. This can be a problem in a multi-cat household because cats can be ambushed by other cats when trying to enter or leave the pan. Being cooped up in a covered pan which is not kept clean also is a deterrent to a fastidious cat. If your cat is not bothered by these things, then use the lid if you wish. Since this “Titanic/Shower Stall” cat pan is not available commercially, you must make it yourself. 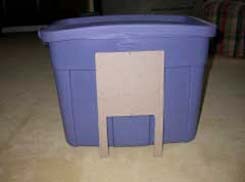 You will need the following to convert your tote into a litter pan – one Rubbermaid Roughneck Storage Tote 18-gallon size (or similar), a ruler, a fine-tipped marking pen, a jig saw, and a piece of fine sandpaper. These totes even come in several colors – blue, gray, and midnight blue. If you substitute another brand of tote, be sure it is equally washable and does not have grooves in the bottom which can trap litter and be a source of odor. 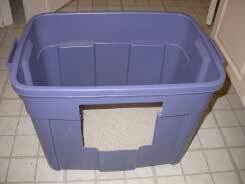 You can even make a larger “shower stall” by using a 31 gallon tote. We use an 8-inch by 8-inch hole at least 6 inches from the floor but you can make the opening larger if you need to. You can make it higher off the floor as well if your cats are not arthritic. The higher opening keeps the litter from scattering as much. As we said above, we prefer the opening in the long side of the pan because the cat must turn at a right angle to use the pan and does not wind up urinating out the door. Putting the door on the long side also seems to result in a stronger pan. Cutting through the end weakens the handle area and causes it to break. We also found that rounded corners rather than squared off ones are stronger. 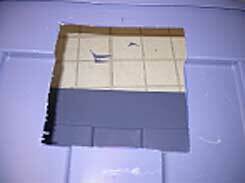 We made a template out of cardboard which is 8” x 8” square and 6” from the floor. You can make a template or just use your marking pen and ruler and mark the opening on the storage box. This opening should be centered on whichever side you use to keep the box as strong as possible. Make a “pocket cut” carefully with your jig saw. 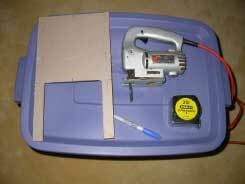 You could also drill a small hole and insert the jig saw blade into it instead of making a pocket cut. CAUTION: You are NOT sawing rigid material like wood. The sides of the storage tote are thin and will “flap” as you cut. It may take some practice to make a perfect cut. But your cat doesn’t care if the opening is perfect! The resulting opening will be rough around the edges, even if you use a very fine saw blade. 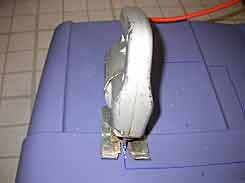 We have not found a blade that does not leave some attached debris around the opening. 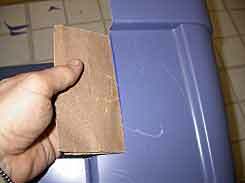 Use a piece of fine sandpaper to smooth the edges of the cut. Try not to scuff the face of the box with the sandpaper. Fill your litter pan with a good quality litter and you’ve got a new “shower stall” litter pan which should solve your problem of your “high Pee-aire”!